Nebraska’s move to the Big Ten in 2010 shook a lot of things up for the Huskers. Suddenly, teams they had played against for years disappeared from the schedule, replaced by Nebraska’s new Big Ten brethren. With a conference shift, rivalries often go by the wayside. That has been a popular topic this week with Colorado set to come to town to renew an old rivalry with Nebraska on the football field. Oklahoma will return to the schedule in a few years as well. But the Huskers have struggled to establish new rivalries in the Big Ten. This is only Nebraska’s ninth season in the conference, and let’s face it: the Huskers haven’t been particularly relevant. That’s a bad combination for building up the kind of hate and respect for any other team that leads to a rivalry. That will come with time, and a little success at the expense of Nebraska’s conference mates won’t hurt either. But there is one school that Nebraska sees every year (or close to it, depending on the sport) and has done so for some time: that school about 60 miles up I-80. Nebraska and Creighton have plenty of history and the close proximity sets the stage for a natural rivalry. Creighton obviously doesn’t have a football team nor does Nebraska have a men’s soccer team, two programs in which the respective schools invest heavily. The Jays have controlled the series in men’s basketball recently with seven straight wins and they’ve made the NCAA Tournament more often than not while Nebraska… hasn’t. Tim Miles and his squad will look to change that this season with the team’s top four scorers returning and Creighton’s top two scorers from last season gone. The matchup has been much more even on the women’s side in hoops as Nebraska holds a 5-3 edge since the Huskers moved to the Big Ten but has only outscored Creighton by nine total points in those eight meetings. The Jays have made the NCAA Tournament in each of the last two years while Amy Williams got the Nebraska program back on track last year after a severely down season in 2016-17 and should continue to challenge for postseason berths. There could be something brewing there. Both baseball programs have struggled when it comes to postseason success recently, and that’s hurt the importance and interest in the series between the two teams, especially when Nebraska wins that series almost every year. That leads us to volleyball, the one true program at Nebraska that hasn’t had a problem building up rivalries. As soon as the Huskers arrived in the Big Ten they began competing for conference titles juts like they had in the Big 12, setting (no pun intended) their sights on challenging arguably the most dominant program in college volleyball at the time, Penn State. Nebraska and the Nittany Lions have had some incredible matches over the years with conference championship and NCAA title implications. It has quickly become one of the most exciting and intense rivalries in the sport. But as Thursday night’s comeback for the Huskers against the Jays in Omaha showed, there’s room for more than one when it comes to rivalries. Nebraska has dominated the series with Creighton. In fact, the Huskers are undefeated — 16-0 since Creighton’s 1994 reinstatement. However, under Kirsten Bernthal Booth, the Jays have been creeping closer and closer to the Huskers, from a Nebraska sweep in 2015 to a four-set win for the Huskers in 2016 to a five-setter on Thursday. 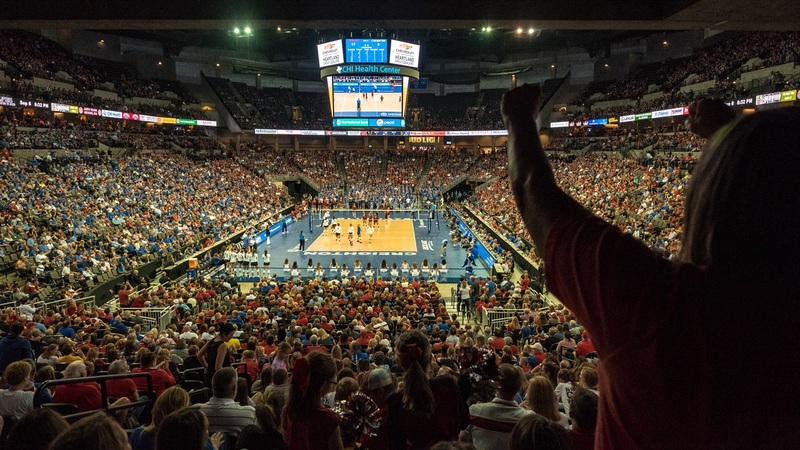 The rest of college volleyball will be hard-pressed to top what a regular-season record crowd of 14,022 saw at CHI Health Center Omaha in terms of level of play, individual efforts, competitiveness and overall atmosphere. The players on the court brought their A games and so did the fans in the stands. Both sides looked every bit the part of top-10 teams on Thursday and although the Jays didn’t manage to secure their first win over Nebraska despite taking a 2-0 lead in the match, they sent a message that Creighton is here to stay, a message that has been building up over the last few years with Creighton’s dominance of the Big East and runs in the NCAA Tournament. Under John Cook, Nebraska certainly isn’t going anywhere either with three Final Four appearances and two national titles in the past three years. The veteran-laden Bluejays missed out on their best chance yet to take down a relatively inexperienced Nebraska team outside of two seniors, but both sides have a considerable amount of young talent as well. Nebraska recruits at an elite level every year and Creighton is getting to that point with a top-10 recruiting class nationally in 2018. Thirteen underclassmen saw the court on Thursday between the two teams and though the likes of Mikaela Foecke, Kenzie Maloney, Jaali Winters and Taryn Kloth will be moving on, those freshmen and sophomores will keep the rivalry going. Both sides have said they intend to continue the series for as long as it works for their schedules, and that is a gift for a volleyball-crazy state. On Thursday, fans sporting red filled the arena, but Creighton had its own sizable and vocal segment of the crowd in blue as well. Thursday’s match set a high standard for the rest of the athletic programs in Lincoln and Omaha to live up to when it comes to any single game for the duration of the 2018-19 calendar. Right now, the volleyball programs are the crown jewels for both athletic departments, and Creighton versus Nebraska is a rivalry worth investing in.